Background: Tong-Bi-Si-Wei-Fang (TBSWF) is a candidate formula of Traditional Chinese Medicine (TCM) for treating rheumatoid bone diseases, which is composed of rhizoma corydalis alkaloids, saponins of glycyrrhiza uralensis and panax notoginseng, flavonoids of rhizoma drynariae and glycyrrhiza uralensis. Objective: Trahydropalmatine (THP), the main active ingredient of rhizoma corydalis alkaloids, was selected to study in vivo pharmacokinetics and druggability of TBSWF. 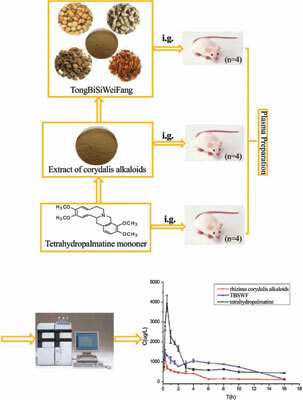 Methods: The plasma concentration-time (C-T) profiles of THP and the pharmacokinetic property parameters after oral administration of THP monomer, extract of corydalis alkaloids (ECA) and TBSWF to rats, respectively were compared by a fully-validated HPLC method. Results: Compared to the THP monomer, the THP in TBSWF is absorbed faster, resides in the plasma longer and has a similar apparent volume of distribution Vz/F (10~20 L/kg). Compared to THP monomer and THP in TBSWF, the area under the concentration-time curve AUC 0-t of THP in ECA decreases two-third; Vz/F of THP in ECA (85.02 L/kg) is significantly higher than that of THP in TBSWF(p <0.05). Unlike THP monomer and THP in ECA, double peaks are observed in the C-T profile of THP after oral administration of TBSWF. THP in TBSWF exhibits slow release to a certain degree. Conclusion: The interactions among the ingredients of TBSWF promote the adsorption and prolong the residence time of THP in vivo, and provide an explanation for the advantages of TBSWF from the point of pharmacokinetics. Pharmacokinetics, Tong-Bi-Si-Wei-Fang, tetrahydropalmatine, Rhizoma corydalis alkaloid, LC, rat plasma.